About Duley and Associates, Inc.
We have well qualified personnel, most of which have been with us for many years. Since 1994 we have performed over 160,000 surveys. We believe we are the best at what we do and look forward to providing our clients with many more years of service. 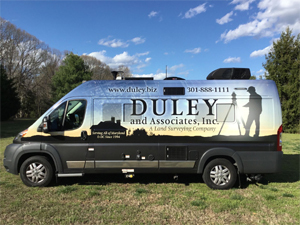 Andy is the owner of Duley & Associates, Inc. He started the company in 1994. He has been in the land surveying field for over 30+ years. Jerry has worked in the surveying field for over 18 years, he is licensed and registered in the State of Maryland and in the District of Columbia. Chris has worked in the surveying field for over 28 years, he is licensed and registered in the State of Maryland. Chevas is our Office Manager. She has been with us for over 18 years. Chris is our head draftsman and has been with us for over 13 years.